So, your nerd cave is looking pretty festive now, what with your dying pine tree being adorned with all manner of sparkly goodness and a strange incarnation of Santa with the body of a Horse, but what about you? You’re still there, wearing your drab non-festive clothes that you wear all year ’round. Let’s festivise (may or may not be an actual word) you! We start off with one of my personal favourites: Space Invaders. 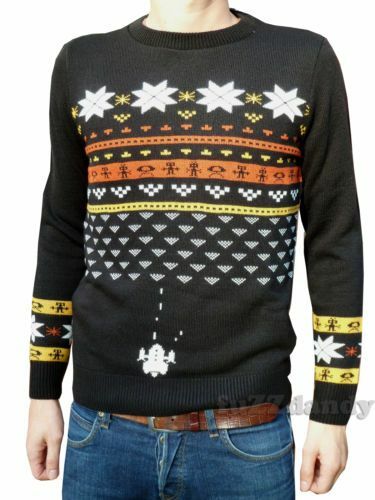 Now, you may not think that a 1978 arcade game about a lone laser-armed defender blasting wave after wave of alien attackers is very festive, but you’d be wrong apparently, as this festive jumper clearly demonstrates. Doesn’t that make you feel festive? More Christmasey than a Reindeer eating a mince pie! Sticking with the gaming theme, how about this rather fetching Minecraft offering (discovered, and purchased by my Real Life boss – who is modelling it rather splendidly below)? Even my boss got all festive for the occasion. 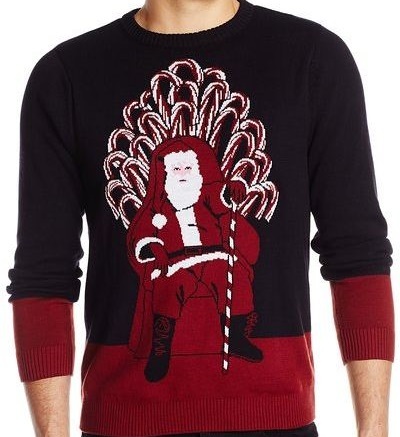 Ok, so we’ve got jumpers pretty well covered (feel free to share any particularly good/bad ones that we’ve missed), but what about an outfit for those that want something a little different, those who are willing to put in a little more effort to their festive clothing choices? Well how about speaking in rhyme and trying to steal the holiday? 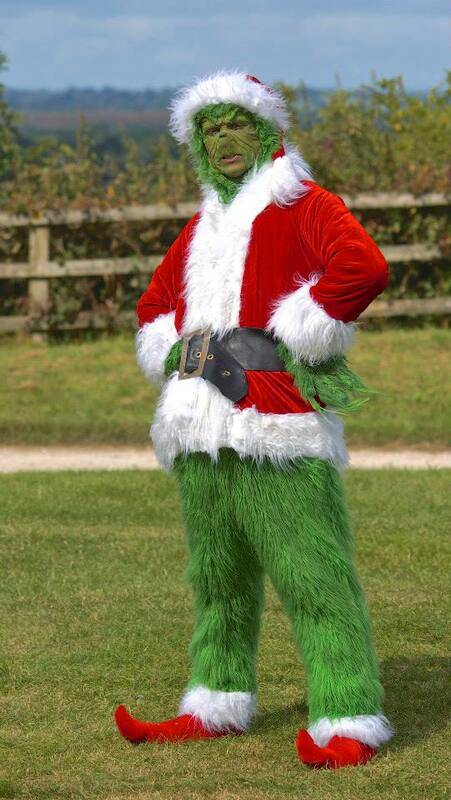 This rather impressive Grinch cosplay was put together by the immensely talented Jason Coster (check out his Cosplay/Props page), and is sure to be the main attraction at any festive event – what chance does a mere roast Turkey stand against something this awesome? So there you have it. 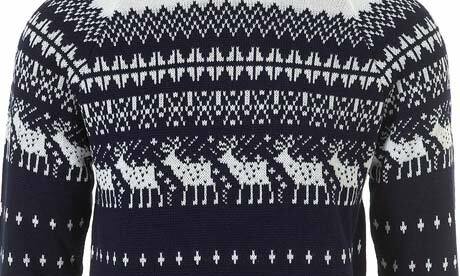 By now you should be feeling suitably festive and snug in a polyester-blend themed jumper…. 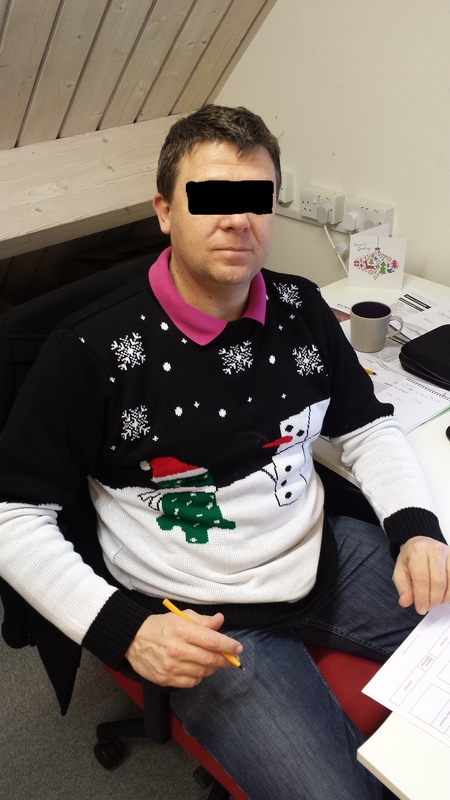 This entry was posted on Wednesday, December 17th, 2014 at 7:46 PM	and tagged with christmas, christmas jumper, Geekmas, Rooney and posted in Uncategorized. You can follow any responses to this entry through the RSS 2.0 feed.